I try to keep freezer meals handy at all times in an effort to circumvent the inevitable week that goes awry, and still put a well-rounded dinner on the table. This Italian Skillet Chicken dinner is a family favorite. Oregano, basil, and garlic season the chicken while grape tomatoes, onion, and olive oil break down to make a rich and fragrant pan sauce. Pull the whole thing together with a couple of handfuls of spinach and dinner is on the table in less than 30 minutes. Use boneless skinless thinly sliced chicken breasts, tenderloins or tenders (depending on how your supermarket labels them). Because they are thin, more of each bite is covered in the marinade and they cook in a fraction of the time it would take to cook a thick chicken breast. Use a 12-inch skillet (measured across the top) with high sides to cook this meal. 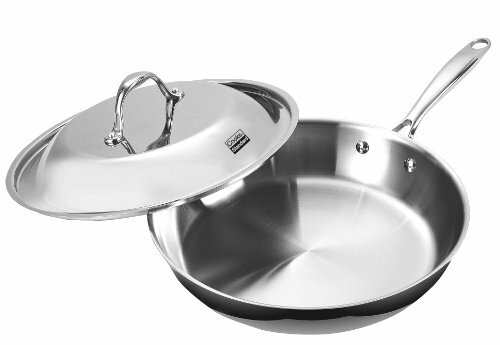 A smaller skillet may not be large enough to fit all of the ingredients. If you make this on a day when you don’t have the suggested vegetables on hand, don’t worry about it. Serve the chicken with a side salad over pasta or with a vegetable of your choice. To make this meal budget friendly, stock up on chicken when it’s on sale. Take a little time on the weekend to whip up a few marinades, dress the chicken and freeze them in bags. That way they are ready on days when you don’t have extra time to think about dinner. 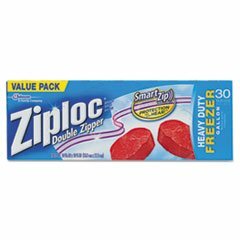 Use gallon-size freezer bags that you press to seal rather than those with a zipper slide. Write the date, name of the recipe and SimplyRecipes.com so you can easily find the recipe later. Add the chicken and marinade ingredients to the bag. Squeeze as much air as possible out of the bag and close it. Smoosh around the chicken until it’s well coated in marinade. This will keep in the freezer for up to 6 months, and up to 48 hours thawed in the refrigerator. Not a planner? No biggie! You could still make this whole dish start to finish in one night and have dinner ready in 40 minutes or less. LOOKING FOR MORE GREAT FREEZER MEALS? 1 Label the bag: Use a sharpie to write the date and the title of the recipe on a gallon-sized zip top bag so you can easily find it on SimplyRecipes.com when you want to cook it. Alternatively, write the cooking instructions on the bag. 2 Combine the ingredients: Roll down the opening of the bag a little just so you don’t accidently get raw chicken juices on the outside of the zip top. Add the chicken, spices, zest, lemon juice, garlic and olive oil. Remove as much air as possible and seal the bag. Smoosh the chicken around so it’s coated in the marinade. 3 Lay the chicken flat in the freezer and freeze for up to 6 months. Alternatively, you could skip the freezer and let it marinade in the fridge for a couple of hours and up to two days, then cook it according to the directions below. 4 Thaw the chicken before cooking: Take the chicken out of the freezer in the morning before you go to work, and it will be ready to cook by the end of the day. 5 Prepare the onion: Peel and trim the stem ends of the onion, but leave the stem intact so it can keep the onion layers together. Slice the onion in half. Then slice each half into 5 wedges leaving a little stem with each one. 6 Cook the chicken: Set a large skillet over medium heat add 2 teaspoons of olive oil. Once the oil shimmers, add chicken and any marinade in the bag. If any chicken is folded up, unfolded it so it lays flat in the pan. Cook the chicken for 2 minutes, then flip it. 7 Add the vegetables: Add the onion wedges, tomatoes, and capers. Cover with a lid. Let everything simmer together for 12 to 15 minutes. The tomatoes should be soft, and the onions dull in color. 8 Check the chicken: Check the chicken to see if it’s cooked through by cutting a piece open. If the juices run clear, and you don’t see any pink the chicken is ready. Use a fork to remove the chicken to a plate and tent with foil. 9 Finish the sauce: Turn the heat up to medium high. Add 1 tablespoon butter to the sauce. Stir it in and let the sauce reduce uncovered for about 2 minutes. Add the spinach stir to coat a couple of times until the spinach has wilted. 10 To serve: Nestle the chicken back into the pan, and season to taste with salt and pepper. Bring the skillet to the table. Spoon up chicken, vegetables and sauces into shallow bowls or plates. Serve with crusty bread to sop up the sauce. Hello! All photos and content are copyright protected. Please do not use our photos without prior written permission. If you wish to republish this recipe, please rewrite the recipe in your own unique words and link back to Italian Skillet Chicken with Spinach, Tomatoes, and Onions on Simply Recipes. Thank you! Very good, used a cup or so of frozen spinach and microwaved it a bit so I could get excess moisture out. Served over pasta. Hi, Kjill — Great idea to use frozen spinach, and serve it over pasta! I love versatile dishes! Thanks for letting me know you enjoyed the meal! Easy and delicious! Great weeknight dinner! Hi, Carol! Thanks for letting me know you liked it! Have a great day! The taste of this reminded me of walking into an amazing Italian restaurant. The flavors were so on point that this is going to be a regular weeknight meal at our house. Hi, Marta! Thanks so much for your comment! I’m glad this will be on the rotation in your home! I made this tonight and it was fantastic! I doubled the garlic, because that’s how I roll, but yeah, good stuff! Definitely making up a few batches of the chicken in marinade to go in the freezer. Hi, Al! I feel you on the garlic! I’m glad you plan to make this again. Thanks for letting us know how much you enjoyed it! Excellent! Easy and wonderful flavors. Hi, Abcp! Thanks for letting me know you liked it! Hi, C. Gliebal! Thanks for letting me know you enjoyed this recipe! I hope you have a great day!